Bert Coules, Mark Gagen, Your Correspondent, and Steve Doyle enjoying a few glasses of the dark stuff (or in Bert's case orange juice) at McSorley's Old Ale House. Photo courtesy of Jacquelynn Bost Morris. Thoughts on inscribed and autographed books after the 2016 BSI dinner weekend. In a chapter of his most wonderful book about the collecting mania, Penny Wise & Book Foolish, Starrett announced that he had long since given up collecting autographs. Of course, if Starrett stopped buying autographs, he never gave up buying books with inscriptions by the author. A simple signature or a long note from the author always whetted his appetite. I was thinking about autographs and inscriptions earlier today as I sat at Studies in Starret’s international headquarters while a blizzard buffets the house. It seemed like a good time to sort through the stack of books that came home with me from the 2016 Baker Street Irregulars dinner weekend. Many of these books have signatures or inscriptions and, as the snow piles up outside, it’s pleasant to remember how pen came to be placed on paper. Bert Coules and I at the Mysterious Bookshop. Photo courtesy of Steve Doyle. Take this one for example. This is the original edition of Bert Coules’ 221 BBC, the story of how Bert came to be an important part of a remarkable effort: The only radio production of all 60 stories in the Canon. I have a later, much expanded edition of Bert’s book, but never picked up the original, until that Thursday morning in Otto Penzler’s Mysterious Bookshop. After doffing my coat and heading to the back wall where there is an overwhelming amount of Sherlockiana, I could not help but notice Bert was up on the ladder reaching out for a slim volume on the top shelf. After he came down, I ascended, brought down that book and asked him to sign it. Steven Doyle was there to capture the act with a photo. Put it together with the inscription, and it’s a moment to remember. It was also at Otto’s that I ran into Don Hobbs, whose passion for foreign language editions of the Canon knows no bounds. 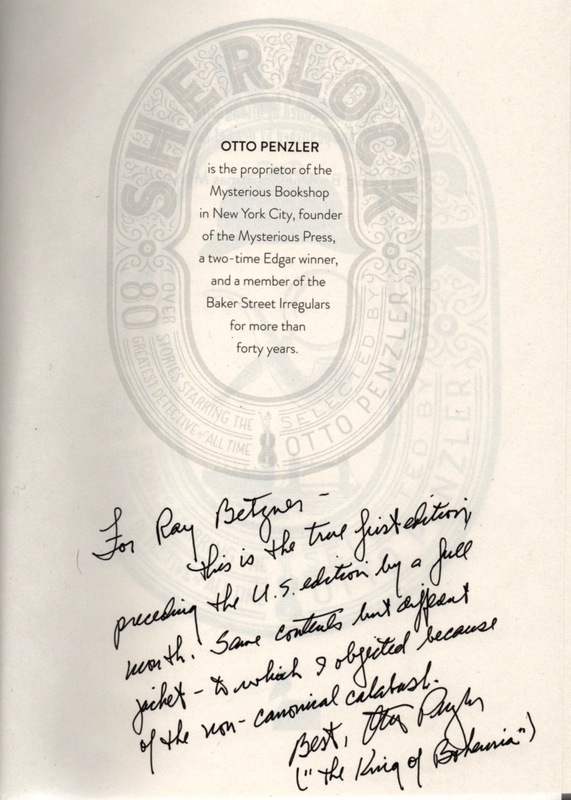 Don co-edited Spain and Sherlock Holmes, so it seemed a good time to get him to sign this copy. Don is one of the most companionable collectors I know, and it was great to catch up. We’ll be working together this year on a little project and I look forward to having more contact with him as time goes by. In case your wondering, "el juago esta en marcha" roughly translates to "The game is afoot." And of course, Otto himself was presiding over the floor of his shop. Of special interest was his The Big Book of Sherlock Holmes Stories and its British cousin, simply entitled Sherlock. The British edition came first, and while its title is shorter, the book comes in at a whopping 899 pages. Compare this with its slimmer American cousin, at a mere 789 pages. I’m delighted that Otto was willing to inscribe each edition. Just one more before I close. One of the great pleasures of being involved with the BSI has been getting to know folks who have become not only “Sherlock Holmes friends”, but life friends. Steve Doyle falls into that category. Although we don't see each other often, we always pick up right where we left off and the pleasure of hanging out with each other never diminishes. Steve did a great job on this year’s Christmas Issue of The Baker Street Journal and I am more delighted that I can say about having him inscribe this copy. The weekend brought many more signatures and inscriptions that I treasure (Don Redmond, Matt Laffey, Jenn Eaker, Scott Bond and several others) but I’ve done enough showing off. It’s time to run the snow blower for a while. Read books. Have a drink. Stay warm.